Country music legend Toby Keith pivoted on the hardwood and joined the Hields for one of the day’s many frozen moments. Keith is a son of Moore, Okla., and he has remained a Sooners diehard on his way to 20 No. 1 hits and international superstardom. Buddy Hield’s 37-point detonation against No. 1 Oregon in the West Regional final was a day for greatness to recognize greatness, and no one captured the essence of the Buddy experience better. 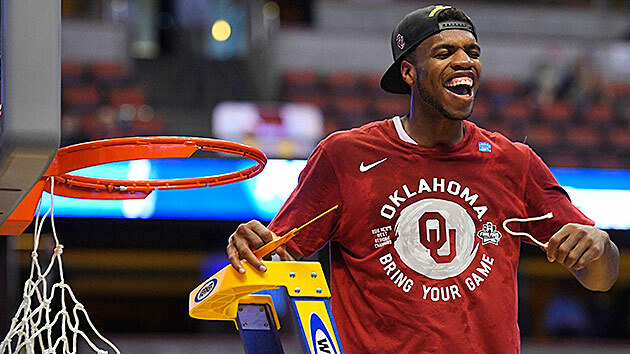 Hield’s team secured Oklahoma’s first Final Four berth since the Price-led crew in 2002. The dominant tenor of the win is belied by the 80–68 final score, as Oregon didn’t come within single digits for the game’s final 25 minutes. Buddy didn’t just lead them, he carried them, cajoled them and captivated them. He’s arguably the biggest college star since the turn of the century to reach the Final Four. Certainly there have been better players and prospects, like Syracuse's Carmelo Anthony, Memphis’s Derrick Rose and Kentucky’s Anthony Davis. But in terms of a four-year star and a top-10 pick who has become the rare college basketball household name, there’s no one who has captivated the country at this high of a level. BYU’s Jimmer Fredette and Creighton’s Doug McDermott never advanced this far. Gonzaga’s Adam Morrison ended his career in heartbreak. And Curry’s magic died in the waning moments of the Elite Eight. Hield’s 25.4 points per game average on the season is the highest of any player heading to the Final Four since Georgia Tech’s Dennis Scott in 1990. Hield has been a generationally dominant player, carrying his team to the highest level with him. This was the 19th time this season he scored more than 25 points and the 12th that recorded at least 30. “I marvel at how consistent he’s been at a high level throughout the year,” Oklahoma coach Lon Kruger said. The only thing that didn’t go right for Hield on Saturday was far out of his control. He declared after the game that he wanted Kansas to beat Villanova, setting up a rematch of the Big 12 rivals who waged the most memorable regular-season college basketball game this year. But the second-seeded Wildcats upset the No. 1 Jayhawks 64–59 in the South Regional final, meaning the Sooners will play Villanova in the national semifinals on Saturday, a rematch of when the two schools met on Dec. 7 in Hawaii and resulted in a 78–55 Oklahoma win. That’s Hield's life these days, only minor problems. His greatness will be on display for at least one more game for everyone to recognize.